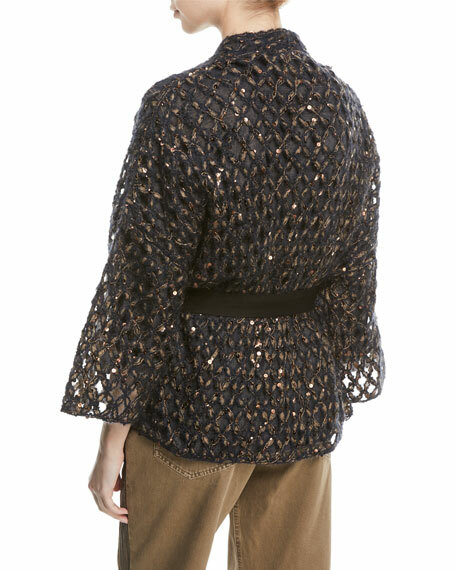 Eileen Fisher cardigan. Wrap front. Long sleeves. Self-belt cinches waist. Long-line hem with side slits. Relaxed fit. Tencel® lyocell/organic cotton/silk. Eileen Fisher cardigan. Wrap front. Long sleeves. Self-belt cinches waist. Long-line hem with side slits. Relaxed fit. Tencel® lyocell/organic cotton/silk. Hand wash. Imported. Model's measurements: Height 5'10"/177cm, bust 33"/84cm, waist 25.6"/65.2cm, hips 35.8"/91cm, dress size US 2-4/FR 34-36. Mara Hoffman "Cora" swim coverup skirt in wavy, brushstroke colorblock print. May also be styled as strapless dress. High waist; self-tie belt. Wrap silhouette. Floor-length hem. Viscose. Imported of Italian materials. Model's measurements: Height 5'9"/175cm, bust 31"/79cm, waist 23"/58cm, hips 34"/86cm, dress size US 0/2. NIC+ZOE lightweight knit cardigan in your choice of color. Approx. length: 22"L from shoulder to hem, 23"L down center back.